Since I’m retired and cannot make biweekly contributions to TSP any longer, I am wondering if it would be a good idea to move a block of money to the G fund [no risk fund] at an opportune time and then make monthly moves of a portion of the G fund back into C or S funds [equity funds]. I’m thinking this would effectively be dollar cost averaging as I reinvest in in these funds. Any thoughts on this idea? Interesting question and it really got me thinking. I have been wanting to compare some of the more common investment strategies discussed by investors and dollar cost averaging is one of them. Your idea may have a lot of merit depending on your objectives and assumptions about the market. If you believe as I do that the market is over-valued and now is an “opportune time” to move to the G fund then need a way to begin moving back into the market later, it has a lot of merit. On the other hand, I do not consider dollar cost averaging an investment strategy and you still need a strategy to protect nest egg from large losses – market risk. Your monthly allotments into your account with allocations to stocks and bonds is not considered dollar cost averaging. Dollar cost averaging is a method of entering the market when you come into a large sum of money and you can either invest it all at once or spread your entry over a short period of time – a year is often recommended. Dollar cost averaging does just what it says, it averages your entry price over the time you are investing by making smaller investments spread out over time. If the market is trending up during this time you would have been better off with a lump sum investment upfront, but if the market trends down you are getting a better average price. Dollar cost averaging assumes you cannot time the markets. Market timers would not use dollar cost averaging. It is designed for buy and hold investors to enter the market upon receiving a large sum of money such as an inheritance or a large bonus. Dollar cost averaging therefore is a financial risk management method for investing new funds, but does not reduce market risk on current investments. Financial risk is mitigated by ensuring your are not buying the highest price of the year as one moves a large sum of money into the market. Once invested, dollar cost averaging does nothing to protect you from those 50% losses bear markets bring and that we have been through twice in the last 18 years. Automatic monthly investing has a similar effect of averaging into the market over time, but this only applies to the new money coming in and does nothing from a risk perspective for the funds accumulated in previous years. You need a different risk-mitigation strategy for your nest egg. Which brings us to some practical points about TSP or other retirement accounts. Making monthly contributions to your TSP or retirement account is just plain smart. But how you allocate within the account is a different animal. Once your money is invested, you need to worry about market risk which I define as the risk of large drops in prices. Proper diversification based on your age (situation) should be part of your investment strategy especially if you are a buy and hold investor. Having high allocations to stocks in retirement is usually not smart. A young investor does not have the same exposure to market risk as someone near or in retirement. Compare someone who is 30 and has only $10,000 allocated 100% to equity funds and with $5,000 of automatic contributions per year to someone who is 60 and has $1,000,000 allocated to an equity fund with $15,000 automatic contributions per year. How does a 50% drop in the stock market effect each of them? Frankly a 50% drop would be helpful for the young investor. Sure, they lose $5,000 but they are now entering the market at a lower price and they only lost the equivalent of 1 year’s contributions. The benefit is they hopefully learn a valuable lesson about the markets while they have little at risk. The 50% drop for the older investor costs them $500,000 or half their nest egg with little hope of making it up. While their new $15,000 contributions will enter the market at a lower price, it is materially insignificant compared to the loss of their life’s savings. In other words, the entry price you get on new contributions has less impact on your financial well-being as your retirement account grows. You still need an investment strategy for your current funds. Buy and hold is considered an investment strategy if you are properly diversified based on your age. Buy and hold assumes you can’t time the market, so when the market crashes 50% the theory is you just hang in there because you will be back to break-even in 10-20 years. Don’t try to tell the Japanese this – the Nikkei 225 is 52% lower than its 1989 peak even though it is up 225% since 2012 thanks to their central bank buying stocks with money created out of thin air to prop their market up. Many studies prove the obvious – future returns are higher when starting market valuations are low, and future returns are lower when starting valuations are high. Hence, buy low and sell high also applies to market valuations. Today, the SP500 (TSP C fund) is overtaking the valuation levels of 1929 and 2000 in terms of many reliable measures to include the median price-to-sales (P/S). P/S is currently significantly higher than the 2000 stock market bubble level. Median Shiller Price-to-Earnings would be at historic highs if adjusted for historically high corporate profit margins. It is simply hard to argue that buy and hold is going to produce good returns over the next decade. Which brings us back the question of would it be a good idea to 1) shift funds to the G fund at an “opportune time” and 2) start dollar cost averaging into the equity funds. Yes, now would be an opportune time. You might even want to dollar cost average out of the equity funds. But if you are retired, then you need to shift more rapidly to an age appropriate diversified allocation – like soon. Yes, but wait for better valuations to start dollar cost averaging back into equities. One of the most difficult things to do is to invest back into the stock market after a significant plunge or correction. But if market internals start to improve and risk- sensitive investors start re-entering the market it would be a good time to start tip-toeing back into the market. My recommendations above are based on the opinion that financial assets overvalued today and there will be a much better time to re-enter the market in the future. It is my long view of the markets, not necessarily my short-term perspective. While market valuations determine long term returns you can not use them to time the markets. Since determining the exact bottom of a bear market is difficult, using dollar cost averaging to re-enter makes sense. It would also make it psychologically easier to re-enter stocks when fear is driving the market. But of course, you must have a large sum of funds sitting on the sidelines to dollar cost average back in later. And for that, you need an investment strategy that avoids market risk. 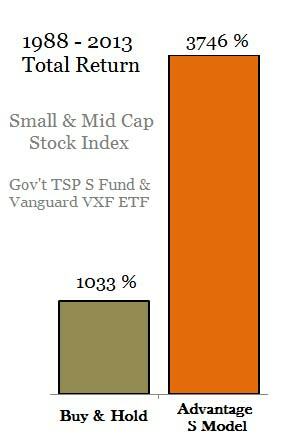 TSP & Vanguard Smart Investor focuses on two market risk mitigation strategies 1) a simple-to-execute objective strategy that avoids the unfavorable season for equities each year and 2) reducing exposure to equities at high valuations with growing indications of risk aversion (market top formations). On the date of posting our strategy is on the sidelines for the unfavorable season in equities and we are monitoring risk aversion signals and market internals for indications of a market top or large correction.